As a result of my poor food management, I had two boxes of opened puff pastry to use up. I could have used it up on a chicken pot pie but it’ll be boring because there won’t be anything new to blog about. As I was making mushroom soup for dinner, I thought of having something garlicky and cheesy to go with it, and suddenly, I was reminded of those breadsticks that I love nomming on. 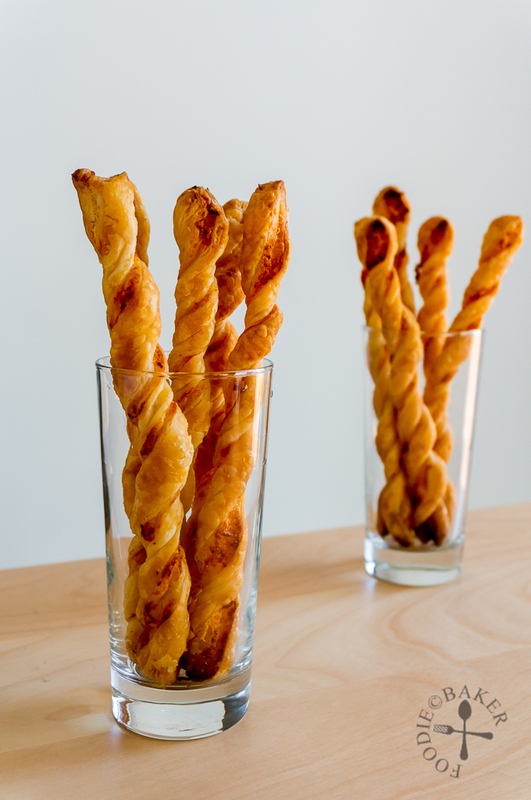 And so, these garlic parmesan twists were born! These garlic parmesan twists were easy to make, and even easier to eat – be very wary of them because you will unknowingly finish many of them in one go! I ate about 3 or 4 of them while they were still warm, and took one almost every time I walked past them, yes they were that addictive! 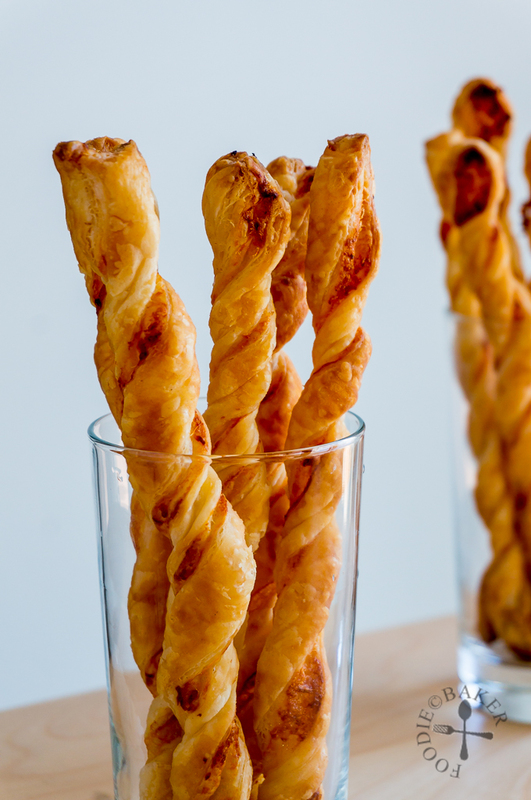 The first batch of garlic parmesan twists that were crooked and twisted – I don’t know why! Melted butter, garlic, freshly grated parmesan and a bit of cayenne pepper were mixed together to form an easy-peasy filling. You can use more garlic if you love garlic a lot, but the amount I used gave a just nice garlicky flavour without leaving you a garlicky breath. 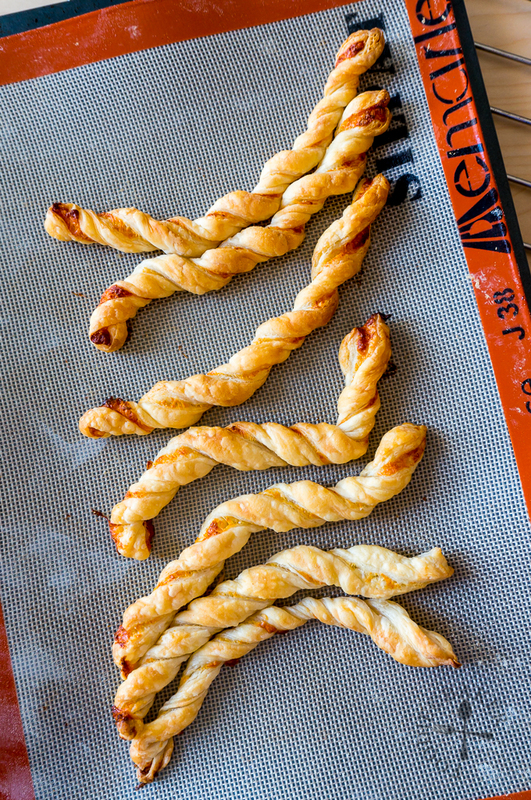 Puff pastry is the secret shortcut ingredient here to make these garlic parmesan twists because it’s buttery and gives the twists a crispy and flaky texture. In the end these garlic parmesan twists didn’t go very well with mushroom soup, because they don’t soak up much soup, but they did made incredibly delicious, buttery, flaky, crispy, garlicky and cheesy snacks that I can absolutely guarantee that you won’t stop at one! And here’s how to make them! Preheat oven to 200C / 400F (fan-assisted). Line baking sheets with parchment paper or silpat and set aside. Combine butter, garlic, parmesan and cayenne pepper in a small bowl. Set aside. Dust the tabletop with flour and place the puff pastry on top. Dust the puff pastry and rolling pin with more flour to prevent sticking then roll out puff pastry into ⅛-inch thick - about 17x12-inch big. Spread the butter mixture on the lower half of the puff pastry along the long side. Carefully lift the top half of the puff pastry over the bottom half of the puff pastry to cover the butter mixture. Dust the puff pastry and rolling pin with flour again and roll gently so the puff pastry adhere together. Use a pizza cutter and the rolling pin (or a ruler) as a guide and cut into ½-inch strips. 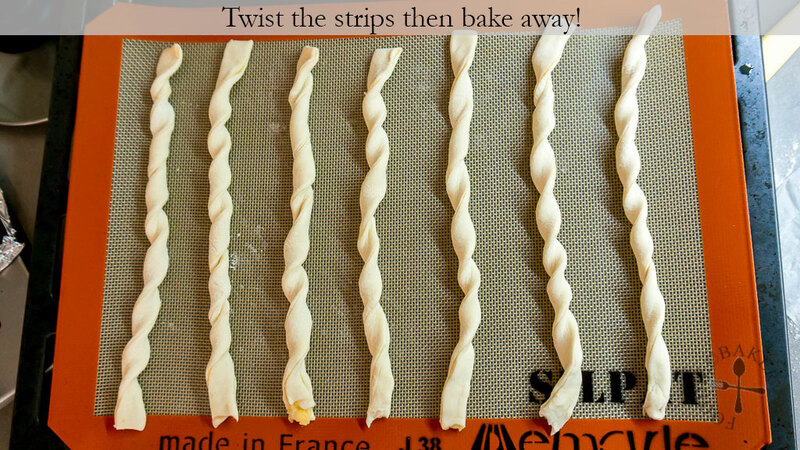 Carefully lift up one strip of dough, twist it and place it on the lined baking sheet. Repeat, spacing the dough 1-inch apart from each other. 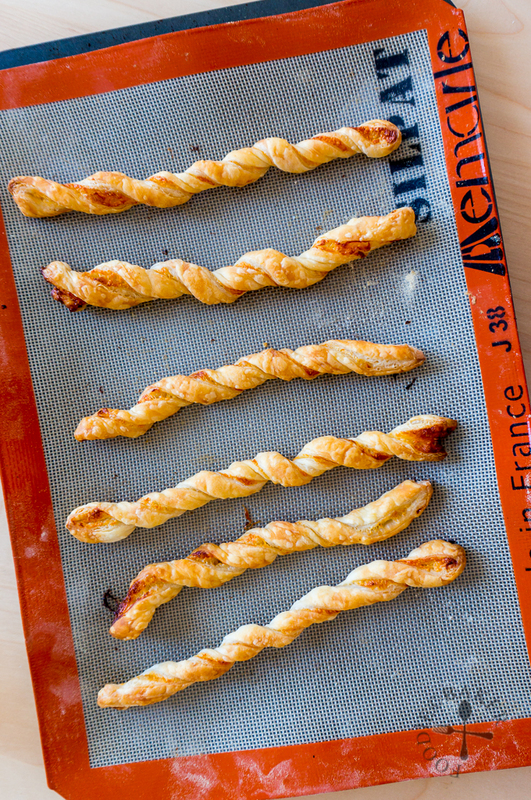 Bake the twists for 15 to 18 minutes until the twists are golden-brown, rotating the baking sheet if needed. 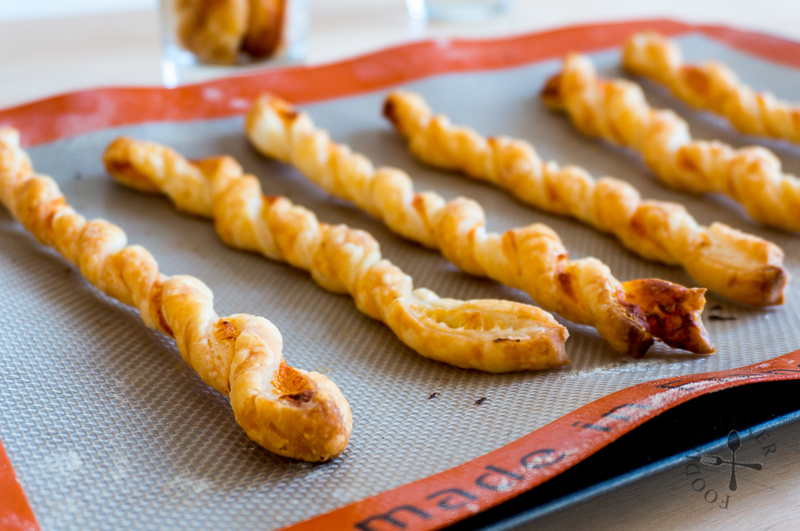 Let the twists cool on the baking sheet slightly or completely before serving. Allow the twists to cool completely, then store in an airtight container in the refrigerator. Toast the twists until warmed through before serving. - I have not tried the recipe with the pre-grated powdery stuff, but I honestly feel that they will never be as good. So do me and yourself a favour and get a block of good-quality parmesan for this recipe (and future recipes that require parmesan)! thanks for this, had recently bought some from Whole Foods, but so much better to make them and tweak the ingredients (different cheeses, maybe some rosemary? ), very helpful step by step guide too! These are fantastic, a “twist” on garlic bread! but its half the hassel of mess and cutting, great idea. I think I could eat all of them. Love these, they look so nice and are a great addition to dinner parties or cocktail parties. Those twists look so yummy! I will definitely try this out.